One of our favorite Valentine crafts for kids, these Valentine’s Day suncatchers are easy & fun for kids of all ages. Today I want to share a beautiful Valentine’s Day craft that makes for a great handmade gift for family and teachers, but also, obviously, a lovely Valentine decoration. Plus it uses inexpensive materials that are surprisingly great for all kinds of arts and crafts projects! PAPER PLATES are sturdy like card stock or poster board, cheap, readily available, and have a built in frame. They are great for drawing, painting, collage, and suncatchers! You can use them for rolling out ink for printmaking projects. They make great butterflies. 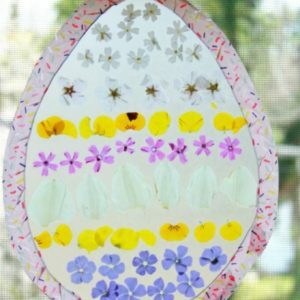 And you can even make decorative bowls and mini Easter baskets out of them! CONTACT PAPER, also called sticky-back plastic, is awesome for all kinds of collage, resist, sensory, stained glass/suncatcher projects, and even DIY stickers. It’s also widely available (you can find it with the shelf liner paper at the grocery or drug store) and inexpensive. INDEX DIVIDERS can be a surprising addition to the art supply cupboard. Who knew?! Buy the translucent colored ones for suncatcher and stained glass projects, collage, and multi-media art. Plus they are awesome on the light table! Although, if you wanted to make this Valentine’s Day suncatcher but don’t have the translucent colored index dividers, you could also easily substitute colored tissue paper, lace, ribbon, flower petals, etc for the colored film. Note: This is one of the many Valentine crafts and activities from my book, The Artful Year: Celebrating the Seasons & Holidays with Crafts & Recipes. You’ll also find process art activities, handmade gift ideas, kid-made cards, decorations, recipes, and picture books about Valentine’s Day. From The Artful Year, by Jean Van’t Hul, © 2015 by Jean Van’t Hul. Reprinted by arrangement with Roost Books, an imprint of Shambhala Publications Inc., Boulder, CO. Colorful hearts catching the light in the window–what could be better at Valentine’s Day? 1. Cut a heart out of the center of the paper plate. Paint the plate with watercolors. 2. Press a square of contact paper to the back of the paper plate so the heart is covered and the sticky side faces the front. 3. Cut the translucent colored index dividers into small pieces. Press them to the sticky contact paper. 4. Use the hole punch to add a hole to the top of the paper plate and string a ribbon through. Hang the suncatcher in a sunny window. Want more seasonal and holiday craft ideas for your family? You’ll find lots in my book, The Artful Year: Celebrating the Seasons & Holidays with Crafts & Recipes, including 23 spring crafts, 10+ summer crafts, 28 autumn crafts, and 39 winter crafts. What are your favorite easy Valentine crafts for kids? Also, what everyday materials do you like to use for family arts and crafts projects? We should start a list of the best non-art art materials!